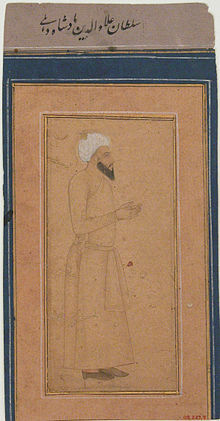 Ala-ud-din Khalji (died 1316), was the second ruler of the Khalji dynasty. He was the most powerful ruler of the Khalji Dynasty. He ruled from 1296 to 1316. He was the nephew (and son-in-law) of Jalal-ud-din Khalji. His son was Khusrau Malik. He wished to become the second Alexander. He took the title ‘Sikander-i-Sani’. He banned drinking of alcohol in open in his kingdom. Ala-ud-din Khalji first conquered Gujarat and Malwa. In 1301 he conquered Ranthambore. In 1303 he captured Chittor. Then he sent a large army headed by his general Malik Kafur to South India. Malik Kafur defeated the Yadavas, Kakatiyas, Hoysalas and the Pandyas. He also took away a lot of wealth. Around the end of his reign, his empire was as large as that of Ashoka the Great (274 BC–232 BC). Khalji needed money to keep a large army. The main sources were taxes. The land tax was fixed according to the fertility of the land. The land tax in the fertile Ganga-Yamuna doab was one-half of the produce. He kept a strict check on the nobles. A group of officers were kept to discourage corruption. He introduced a system of auditing accounts. He introduced a market control policy in which he reduced the price of day to day items such as sugar, oil, cloth etc. Shop owners had to pay the amount fixed by Ala-ud-din Khalji. Officials were appointed to check the shop owners. Whoever was caught cheating, was punished. This allowed Khalji to pay a low salary to the soldiers. With money available to him he maintained a large army. He paid his soldiers in cash. He even started branding horses ( Dagh). This was to prevent the substitution of good horses with low quality horses. He even kept a description of all soldiers in his army (Chehra). He posted spies throughout the empire to prevent rebellions. ↑ "Khalji Dynasty". Encyclopædia Britannica. Retrieved 26 October 2016. ↑ "Interesting facts and history of Alauddin Khilji:the second Alexander". Retrieved 26 October 2016. ↑ "History and Biography of Alauddin Khilji - Important India". 12 March 2014. Retrieved 26 October 2016. Wikimedia Commons has media related to Alauddin Khalji. This page was last changed on 29 January 2019, at 08:43.